I have this annoying problem a few mechanics have not been able to help me resolve. My cooling fan shuts down for about 30-45 seconds and comes right back on. In effect, you hear the cooling fan running all the time. Engine temp stays around 180 degrees. I have also changed the fan switch sensor on the back of the engine (coolant reservoir) still no change, fan continues to run. Any suggestions out there? when my 05 did that, it was overcharged ac. i bled off a few ounces of refrigerant and the problem went away. i think the high side switch was weak and reading too high pressure. If you have a Behr type fan clutch on tour ASET engine it has probably failed internally. This is not always the case, as there have been some wiring harness issues to the fan. On one Vision we had with a Behr fan clutch it use to fail every year and a half. I have an ASET engine. How do you check for a faulty fan before doing an expensive replacement (buying a new one)? Is yours air operated or all electric like the one in this bulletin? I put a new fan in the truck but I have the same problem: Fan continues to come on every 30 seconds even when AC is off. 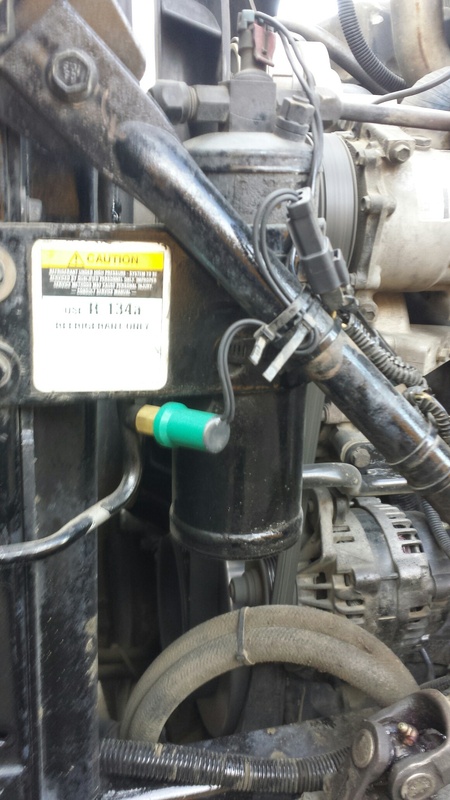 Unplug the 3 connectors from the engine ECM and check for coolant or oil inside the connector. Heck, I turn my A/C on just to kick my fan on to keep the engine running cooler. But I run the city a lot. And spend quite a bit of time idling. I'm also really obsessive about coolant and oil temps. I wish it had an override switch to where you could elect to run it manually. Here's a question for the gurus- if I unplug the A/C compressor, will the fan still kick on if I turn the switch in the cab to the on position? On The ETECH or ASET engines , if you have a air fan clutch , you can add the factory fan over ride switch and have the dealer turn it in the software. On the ASET engines with the electric BEHR fan. There is no option for a fan over ride switch. However I have seen people take one of the wires going to the "green" AC pressure switch on the high side line ( not the one on the drier) cut it and run it in the cab and run it through a switch and back out to the pressure switch. This way you can break the circuit with the switch and turn the fan on as the ECM thinks the AC has high pressure. Plus it's still running through the high pressure switch so it will work a usual. This circuit is active whether the AC is on or off. I unplugged and checked the 3 connectors for the engine ECU. None of them have oil or antifreeze in them. Could a bad ground cause this fan problem? I after lots of guessing and fan clutch replacement (expensive), it turned out to be a bad AC high pressure switch (picture - green switch). Fan works normal now, and only comes on when coolant gets hot. I appreciate the input from all.